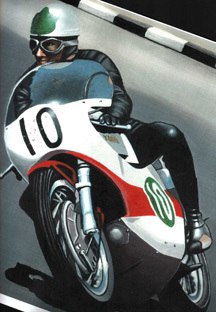 The 12th of July, 1999 marked the 30th anniversary of the death of one of the best and most respected of the World Motorcycle Champions, Bill Ivy. 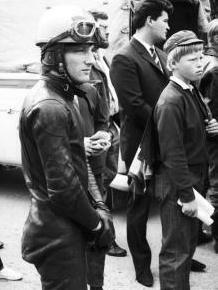 Bill Ivy was born on August 27, 1942 in Maidstone, Kent. Bill died at the young age of 27 following an accident, while practicing for the 1969 East German 350cc Grand Prix at the Sachsenring. 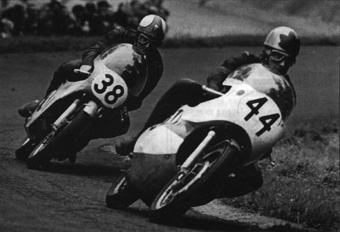 The New Era Motorcycle Club will once again be running the Bill Ivy Trophy race meeting. The meeting is to be held at Brands Hatch on Saturday, 10th of July, 1999. ....As time goes by the Bill Ivy Trophy meeting will inevitably lose some of its meaning, but for those who remember the dynamic little rider, this annual event will always invoke memories, not only of the man, but of an era when sport seemed to be more exciting and certainly used to be much more fun. It is almost thirty years since Bill died, killed in practice for the East German Grand Prix at the Sachsenring. He was only 27, but in a short exciting racing career he had a meteoric rise to world wide fame. For those who never saw Ivy in action or who only vaguely remember his dynamic riding, let us jog a few memories. Bill Ivy was only 5ft 3 ins tall and never weighed more than nine and a half stone, but his slight frame concealed a power house of energy and strength that burst into action whenever he straddled a bike. Bill began racing at the age of 17 on a 50cc Itom. His club was the Racing 50 Club, which later became the New Era Motorcycle Club. He was sponsored by Chisholms of Maidstone and his first race was at Brands Hatch. In only his first year of racing he captured the short circuit lap record for the 50cc class. In 1965 he won the British Championship for the first time and decided to turn professional. A year later he took the King of Brands title away from Derek Minter and also scored his first win for Yamaha at the Spanish Grand Prix. It was from 1996 that Ivy's brief, but quite sensational, career took off and he became one of the exclusive band of "circus" riders that typified the 60's. A colourful, flamboyant character with a fearless riding style, he epitomised the swinging sixties. Although he was seldom out of the headlines and gained something of a reputation as a hellraiser, Ivy always produced the results on the track. 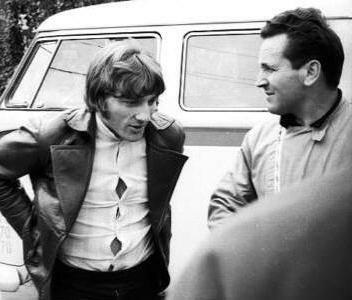 The climax to his career came in 1968 in the duels he had, both on and off track, with team-mate Phil Read. Following Ivy's 125cc world championship win in 1967, the Yamaha factory decided Ivy should win both 125 and 250 crowns in 1968. Ivy persuaded Yamaha to let Read win the 125 championship. This was typical of Bill's sense of fair play. As Yamaha were likely to pull out of racing at the end of the season, Read ignored team orders in the latter part of the season and won both championships. This caused a great rift between the two riders. 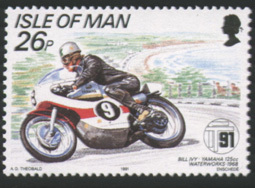 Yamaha did withdraw from racing for the 1969 season, only to return after Bill's death. 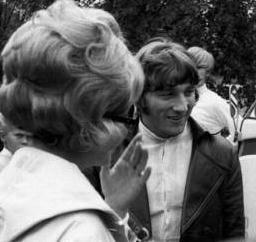 It is noteworthy that they had said in 1969 they would like Bill Ivy to return to them. Following Bill's death, the natural choice would have been Phil Read, but they chose another rider instead. Extremely upset at Phil Read's attitude, Ivy announced his retirement and promptly decided to go Formula 2 car racing instead in 1969. Nevertheless, he did return to the GP scene in 1969, mainly to pay his way in car racing. This time, he was riding for the Jawa factory on a temperamental four cylinder 350cc two stroke. This machine was to be his last competitive ride as he was fatally injured during a wet practice session. There were few eye witnesses to the accident but it was suggested the bike seized as he was adjusting his goggles. 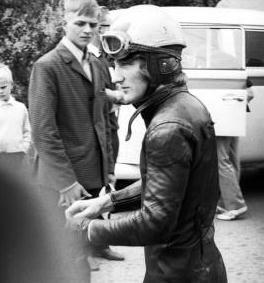 Bill Ivy set many records in his time, but one of the truly great performances must surely have been an absolute lap record for the 125cc Isle of Man TT at 100.62 miles per hour, despite not particularly liking the circuit.